Seven years ago I began a regular yoga practice and in 2014 I completed my Yoga Teacher Training (YTT). 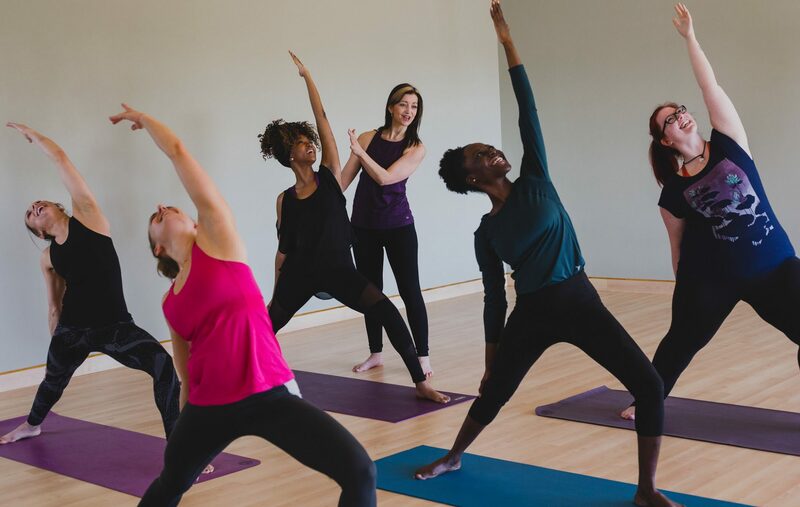 One of the reasons I chose to delve deeper into the world of yoga and become a teacher is because I was seeing benefits off my mat that seemed to directly correlate to what I was doing on my mat. I wanted to share these benefits both with the young people I support every day in the school setting and also with the other individuals that I would end up teaching. Yoga was like the icing on my cake… the cake being my journey to health and wellness. Let me explain…. 8 years ago I was miserable and was making some big decisions to step away from what was no longer serving me (things that were actually making me physically, mentally, and emotionally sick) and to start over and step into being authentically myself. I had been on antidepressants for 7 years. I was a numb, miserable mess. Doctors used terms like fibromyalgia, depression, and anxiety. When I made the decision to turn my life around and find myself, wonderful things started to happen. With my doctor’s support, I got off of all medication. I discovered that my brain’s a little ADD (which I love and embrace) and I began to figure out how to heal myself physically, mentally, emotionally and spiritually. And then, along came yoga. In my first year of a regular yoga practice I learned how to slow down my brain, the physical pain in my body lessened and I began to feel amazing. I was learning to be more in the moment, to accept where I am on my mat in each posture… without judgement… and then I noticed that my life seemed calmer, I was more capable of handling things as they happened, and I was more accepting of myself – and my limitations… like I did when I was on my mat… and that transfered into emotional strength off the mat. On the mat I would dive into new challenges. Off the mat, I began to embrace my new reality and began doing things that years ago I never would have done. Arm balances have taught me to trust myself and if I happen to lose my balance and fall, then I just get back up and try again. I had spent a year attempting headstand. I would try and fail, try and fail, and then try and fail and cry. The old me would have given up after a few weeks of attempts. This new me spent a full year trying, failing, trying again, crying on my mat out of pure frustration, trying again, getting a tiny step closer, trying again (you get the idea) until I finally did it. I learned how to dig deep and connect to the inner workings of my body, to persist and to never give up And then, after all of that, I received a diagnosis with directions to stop headstands. I was upset, but in my own yogi style, I decided to look for something that will challenge me once again to continue to build strength, stamina, and inner fortitude. Maybe it will be a forearm balance or a handstand that I can acheive next. In the meantime, I work closely with my medical professionals to heal myself and maybe one day I will be allowed to do headstands again (or maybe I won’t). Either way, it doesn’t matter because I have learned to accept what is. In my yoga practice, each day I start from where I am at and go from there. Just the same as each day I wake up with a fresh new day ahead of me. I start from that very first waking moment and move forward from there. When things happen in life, as they often do, and I get knocked a little off balance, I hit my mat to work it all out. All we have is this moment so why not be in it and make each moment the best moment yet.